HowToRepairGuide.com: 2000 Toyota Celica: Bleeding Radiator? On this model there is plastic reservoir bottle with a pressurized screw in cap where you fill the coolant. 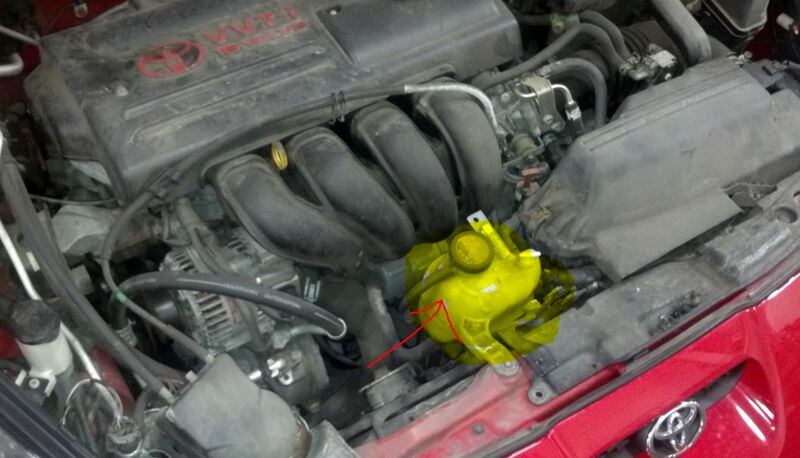 See the Radiator Reservoir diagram and its exact location. These are real bad to bleed the air out of. You have to unbolt the reservoir and lift it up about 5 to 6 inches so it is higher then the top of the engine then open the bleed valve at the top. Run the engine at 2000 rpm and get the coolant flowing ans slowly add coolant and bleed the air at the valve. Then let set and repeat the process with the heater on high. Do repeat this procedure till complete air is bleed out and coolant drip starts flowing out.